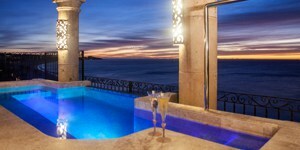 ..is rapidly becoming a luxurious holiday destination for many travelers. While many popular tourist vacations in Mexico are overcrowded and cosmopolitan, Puerto Vallarta has managed to evolve but still keep a small town feel. 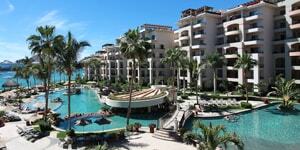 Exclusive hotels and private communities attract a wide clientele ranging from Hollywood stars to Fortune 500 CEOs. For your Nayarit vacation choice, Villa la Estancia is a true slice of heaven. Every Villa is a privately owned condominium, furnished lavishly with all the amenities you would find in the comforts of home. For the finicky traveler, the penthouses at Villa la Estancia are expansive and lavishly furnished, each offering spectacular views. Activities abound make your days in Puerto Vallarta fly by. During the day you can shop til you drop or grab a meal at the many restaurants in town. Puerto Vallarta’s nightlife reputation is legendary and clubbing and bar hopping on foot is easy. With its lushly landscaped grounds featuring a free-form swimming pool, dancing fountains and whirlpool spas, this tranquil, upscale property is a favorite with adults. 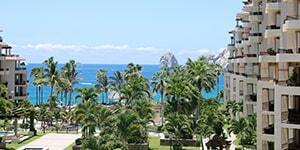 Earth tone colored buildings form a narrow U-shape down a gentle slope to the beach looking out to the Bay of Banderas. The lobby is designed with comfort and privacy in mind with its concierge-style check-in.The distinctive beachfront resort will offer 245 suites. Each of the one, two and three bedroom units is stylishly decorated with marble floors, granite counter tops, whirlpool tub, walk in shower, walk-in closet and spacious balconies. 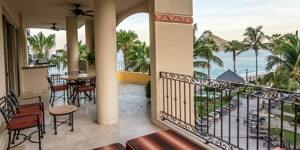 Wrought iron gates open to Hacienda-style entryways where individual doors lead into each unit. Deluxe guest rooms are also available. All Suites feature a complete kitchen with three-stool breakfast bar, full-size refrigerator, four-burner stove top with oven, microwave, toaster, blender, coffee maker, dishwasher, garbage disposal, dishes, cookware and utensils. Other in-suite amenities include individually controlled air conditioning, ceiling fans, Plasma TV’s with satellite movie service, direct dial telephone with voice mail, state-of-the-art entertainment systems with high-speed wireless internet access, electronic safe, hair dryer, iron with ironing board, clock radio, laundry room with full-size washer and dryer, walk-in closet, wet bar on balcony, daily maid service, turn down service (on request) and in-room dining. Boarded by sun deck with umbrellas and loungers, a two-level free form pool is enhanced with gentle waterfalls, garden islets and a swim up bar while three 12-person tubs overlook the beach from the lawn and gardens. The ultimate indulgence, the 17,000 square foot Flamingos Spa pampers with massages, facials, hydrotherapy, body scrubs, wraps and salon service in an upscale European-style facility that’s the newest and largest in the region. My family had a fantastic time in Puerto Vallarta and specifically at La Estancia. We will be a returning customer and will most likely consider Christmas, February or Spring Break again next year. Unit #1505 was fantastic and beautiful. We loved the location of our room to the resort. All of the personnel were super friendly and catered to our every need. The pool is beautiful and we spent a lot of time resting around it. We also enjoyed the area of Puerto Vallarta. As I mentioned, we will be back. The facility was extremely nice and our arrangements were taken care of very well by your company. We had a great time...wonderful location and facilities...the pool, spa and staff were incredible.